Happy Lunar New Year from Jill! It has been quite some time since I have sent out a newsletter. The last year has been quite life altering and transformational for me. I feel like I have been waking up to a new self and wow is that ever profound and at times extremely uncomfortable, unstable, disorienting and yet freeing. Some of you know that after 10 years of living in my home in SW Portland I recently moved to Sellwood. A year ago if you asked me if I would ever move I would have said heck no, never. Yet, as long as I have lived in Portland I have loved Sellwood and imagined how fun it would be to live in an area so walkable and friendly. Just today on my run I stopped to look across the river and realized I was looking out to the exact spot I had walked to from the SW side to peer over the river for the last 10 years. It was like looking at my past, the "me" from the other side and the realizing "Wow, what just happened to my life!". I think this last year may have been like this for many of us. I would imagine whether it was moving your house or taking a new leap in your career or even more hidden, internal ways of experiencing transformational change, we know what it is like to undergo "personal construction". How it changes your behaviors, patterns, thoughts and even the way you see and know yourself. What was interesting about staring at the look out today was that my life today looks drastically different than it did a year ago and I feel so divergent from the woman that used to stare over into Sellwood and dream. Yet, really in some ways I am the same just perhaps a little more aware and familiar with some new parts of myself that had been neglected or maybe more fluid in some views that needed a different vantage point in order to allow myself to take a leap and dream bigger and see what else there could be on the other side. I cannot tell you what a gift moving has been for me. I am feel more inspired, more confident in my ability to be supported and capable of making big changes, feel more connected to community and the joys of walking everywhere. This is astrological time of freeing ourselves from the norm and allowing stability to be fluid place of showing up in each moment with what is in just the way it presents itself and relating to it with curiosity. We grow when we stretch ourselves out of what is comfortable and familiar. It lets us learn to breathe in new ways and maybe it allows us to see we had been holding our breath or barely breathing before. We deepen the way we understand ourselves and each other in our capacity to survive and even thrive in new environments and situations. New skills can emerge and new ways to employ our gifts and wisdom when we break free. Maybe we think we cannot and then we do. Maybe we try and we fail and we say, it didn't destroy me it actually liberated me from the fear that it might and now I am stronger and braver to take another chance. This is the year to take new leaps of faith, to challenge the status quo, to invite in permission to ask "What if and Why". This is the time to explore who we are when we face discomfort and instability and how we can learn to find that inner anchor that keeps us afloat despite at times turbulent seas. This last year has been a bumpy ride at sea for me and maybe for you too. It wasn't all sunshine and rainbows but I did my best to show up for what it was and instead of bracing for impact I tried something new... softening and asking what if I am stronger than I think? What if this feeling of awkwardness and discomfort won't kill me? Indeed I was stronger than I imagined and I bet you are too. Let's all ride those waves of change and liberation together. Another part of this energy is communal effect of change. We need each other and we need inspiration and hope that there are always new ways to see that do allow us to reinvent our reality to more open and spacious and open hearted ways of being alive. We need to know that it is ok and in fact normal to feel clumsy and like you are learning to walk again sometimes in life. We need to sometimes hear "You are doing a good job and its ok to be where you are! You are my community and you have supported me in so many ways this last year that it has touched my heart deeply. I am ready to show up for you this year with some exciting new offerings. They are unfolding organically, some slower than I wish and some I am working out as I go but I am just rolling with it as best I can (fluid strength, right?). I hope that 2019 is a year that you feel the support of our community in inspiring you to make the shifts you are ready to make and to feel the net of love and support beneath you as you soar into the new. 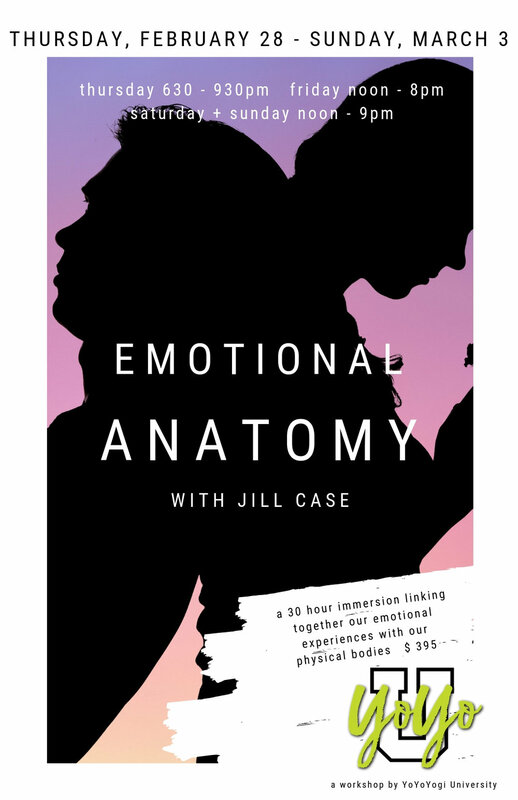 Come join me for extended weekend of healing and introspection as we explore the emotional connection of our experiences to our bodies. Learn how to listen and decode the stories your bodies tell through feeling into areas like the psoas & hips, core, shoulders & neck and our heart centers. Learn how the practice of yoga can evolve into a healing practice teaching you how to care and attune more deeply to your body on and off the mat. All levels, people are welcome. Register and more details here. Save the date: Summer Solstice Retreat in Southern Oregon: June 20-23 More details coming soon! This is a sun inspired weekend to explore the fire element and the gifts of joy, creativity, and passion! Learn about your sun sign and your unique creative potential. Cultivate more playfulness and passion in your life and relationships. Be your own inspiration as you tap into what makes you thrive. This retreat will offer yoga, astrological themed workshops, time in nature for fun and healing and community! If you would like to be sent more information as it comes available check my website or send me a message here. I am still teaching yoga twice a week at YoYo Yogi: Mondays at 4:30pm and Saturdays at 8:30am. Private Intuitive Astrologically inspired sessions: "illuminating the path to discover your potential"
I offer private sessions to work with areas you feel stuck in your life or body as well as new avenues you wish to explore. Astrology can be a wonderful self discovery tool to deepen your understanding to the experiences of your life! I offer my experience as body intuitive, astrologer, and yoga and movement therapist to empower you with tools and techniques that allow you to feel connected to your truth and alignment. Free yourself to be yourself. Find more information here. Astrology of the Times-What is going on? Catch me on the Tonight Show with Cassidy this Friday night on KGW at 7pm for a sneak peak of the upcoming full moon in Virgo and how to work with it. I share my interpretations of the astrology of the times on my website here and on facebook. These times I feel to be taxing on the nervous system..perhaps you are experiencing some mental jitters, having a hard time relaxing or sleeping, feeling confused or disoriented. One of my favorite oils for this time are any of the Firs, Cedarwood, Spruce... think trees! These scents tend to clarify my mind and give me a sense of groundedness. These essential oils are easy to find in grocery stores. One of my favorite physical shapes for this time is legs up a wall. Lay onto your back and place your feet on the wall either at 90 degrees or at an angle. You can even do this before bed with your feet above your headboard. If you are at work or in the car and need a quick nervous system reboot, try tapping your body, face and head. Tapping can get that "restless" energy off your skin and get you into your body. This 3 week time period often gets blamed with all things annoying like car breakdowns, technology failures, communication issues and anything related to the messenger planet. While it can be tricky to confirm or deny this trickster’s handiwork, it is still never a bad thing to slow down and take a little more time with all things communicative and transportation related! During this period Mercury may be encouraging us to reclaim our truth opposed to continuing the momentum of the past’s truth and choices. Match up your vision with the reality of today, where do you need to redo some choices to better align with your Truth! 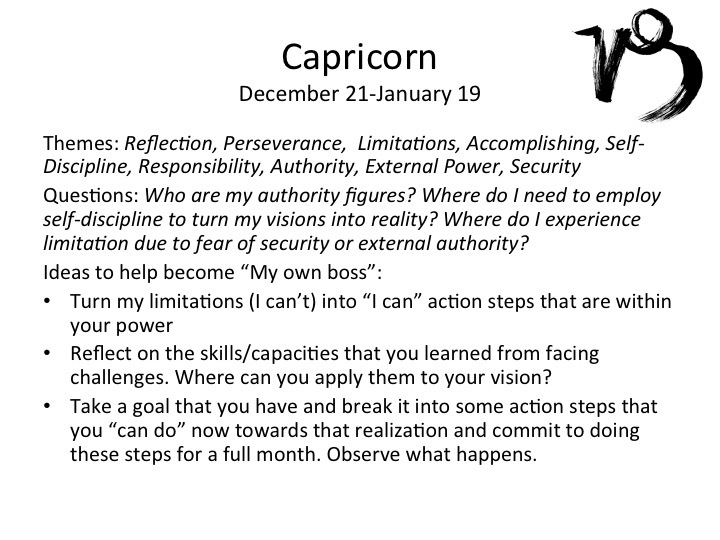 You can usually feel Scorpio coming because the intensity of this time is like being in a pressure cooker…Scorpio asks that we confront the forces beyond our control.. These forces usually come along with strong emotions and issues dealing with those powerful items in our life (money, relationships, loss of anything significant, the past). This is a time to peek into what is hiding in those closets that we don’t want to look at and would rather hide from and pretend don’t exist. When we can face our fears we can take back our power we diminish the control these things have over us. This is a time to face our dark sides for deep healing. In order to be whole we must face the whole of ourselves, the light and the dark! if we are not willing to sit with it then we leave it up to fate to manage and we all know how that usually turns out! This is a time for deep transformation so dive deep friends! Welcome to the time of the scales, with themes of balance and partnership! Here are some tips with how to work with this energy. 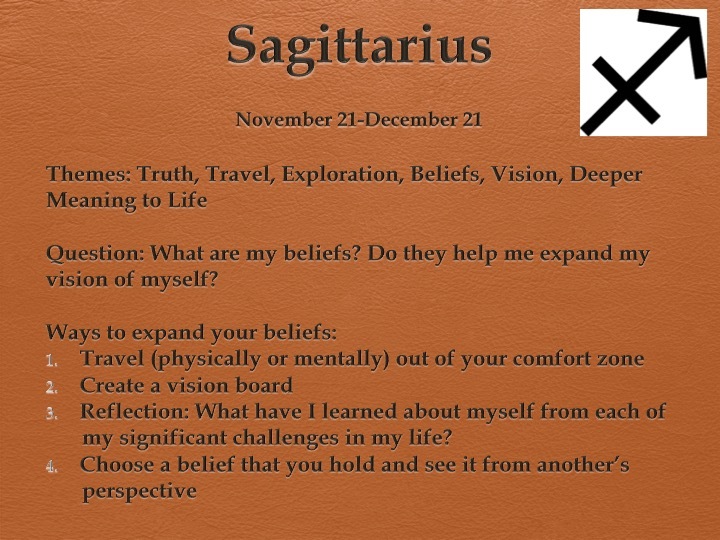 I also write a monthly reflection diving deeper into these themes on my reflection page. If you know you sun sign, here are some ways that coemerging realities may show up in your life. The question is something you may wish to explore through journaling or meditation. Enjoy! I have some suggestions of where you may piecing together your ideal self by your sun sign. I have also listed some suggestions for how how to take some steps to gain that forward momentum! Welcome to Leo! Listen in for some tips on how to work with this creative, heart felt energy that I suggested during my Portland Today appearance on KGW. Welcome to Cancer! Here are some tips on how to work with this time in order to feel in sync with nature. Listen to my segment on KGW Portland Today here on the current cycle! More tips and information can be found on my reflections page! This month we get out and yearn to socialize. We learn and change when we share our ideas with ours and listen to theirs. It keeps us fresh and current. Happy spring and welcome to the astrological new year! 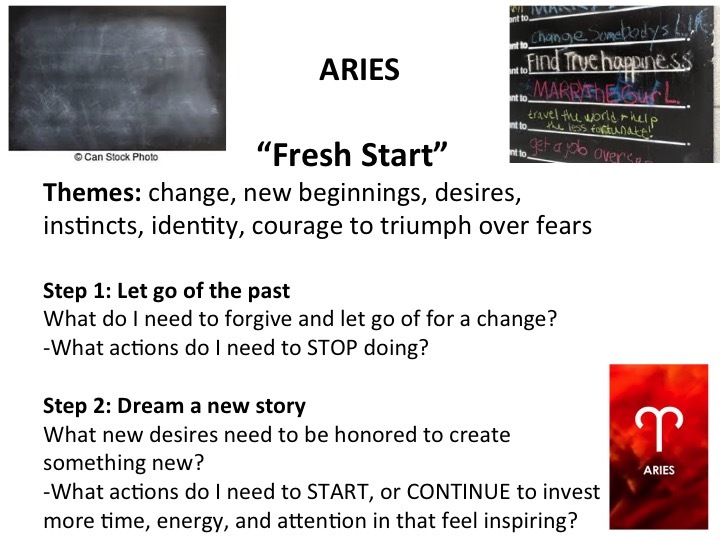 The link below is my Portland Today segment with tips for working with the Aries energy from March 20-April 19th. 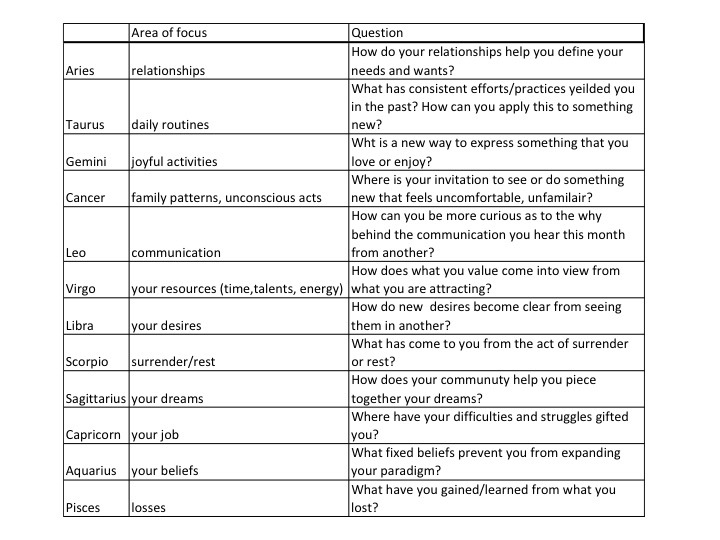 Here are some tips to work with the upcoming shift into Pisces. We have all been working hard, times have been intense, we are all doing our best and at some point we need to remember the balance to effort is relaxing...See if for the next month you could open your heart to forgive, accept and the love yourself just the way you are! Often times the surrender is the biggest step we can make towards our wholeness. This clip was taken from the Portland Today show on KGW. The link below is a short recap from my monthly astrology overview for KGW's Portland Today show. Take a listen to hear a couple tips. Here is my KGW Portland Today appearance where I discuss some tips on how to work with the Sagittarius Cycle this month! 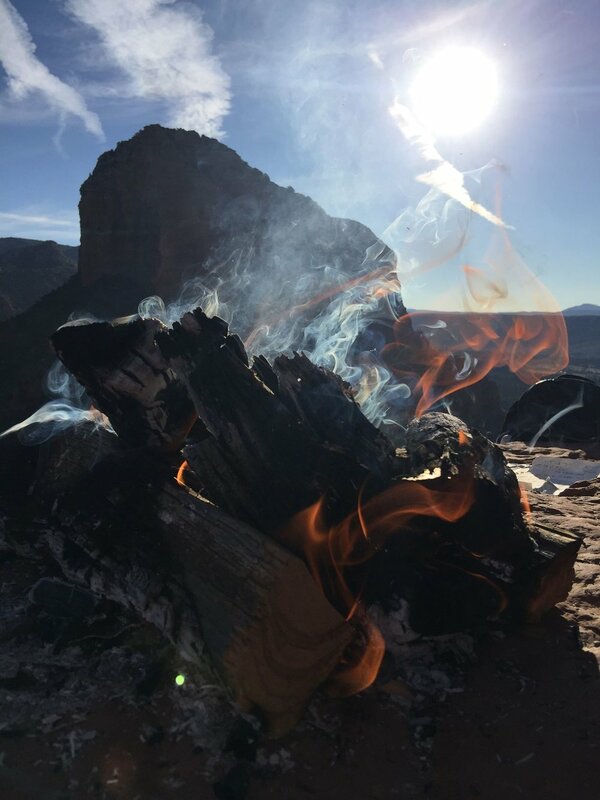 I just recently returned from my retreat in Sedona. I don't even have words to describe the experience we all shared during the Equinox. It was a retreat like none other. Not because the yoga I taught was spectacular. Not because the weather was to die for (but it kinda was). Not because the setting, the food, the hikes and land were breathtaking (and it was). If I had to distill my favorite part of the retreat it was the beautiful Souls that showed up 100% as themselves. We all brought our raw, authentic selves and we were vulnerable. We shared. We supported each other. We experienced family and community. Ten people that were strangers at the start from different walks of life probably never destined to meet if not in this special portal of time we held together. I say "we" because I did too. I had to be held and supported and I could not do it all myself. I had strange reactions to the energy that gave me severe stomach cramps, intense head aches and I felt totally out of sorts for most of the trip. The "plan" I devised before the retreat was replaced day 1. The universe was teaching me about balancing the yin and the yang and here to think I thought I was going to teach a retreat on the topic. Ha! I had to let my guards down (not by choice) and let others help and take roles that I normally would take on as the over doer I am comfortable being. The gift was that they shined and gave so beautifully from their hearts and I was able to receive love and support from their gifts and offerings. This is what these times are about now friends. We need each other. We are in a truly inspirational time of cultivating the courage to act and to step outside our comfort zones and be ourselves. But, the twist is that we cannot and do not have to do it alone. There is support around us and it feels delicious to let go of the reigns sometimes and let others offer up some effort on our journeys. Maybe it is accepting a hug, or an invitation to slow down and take a walk with a friend, or to be vulnerable enough to share your vision with someone who can perhaps lend a missing link to your puzzle. Whatever the way in which you receive, even if it is the love and acceptance of who you are from your own self, don't forget that opening up our heart to let love in is just as valuable as opening our hearts to let the love flow. To the "Zen Renegades" of Sedona I bow to you. To all of you, I send my love and gratitude for the ways you allow me to give and also to receive the fruits of spending my time with you! *Must have attended Part 1 to attend. Call the studio to register at 503-688-5120. What: Explore how to use yoga asana to work with pain/tightness/discomfort in these targeted areas and how to avoid injuries in class when these areas are “trouble zones” in your body. We will practice asanas that work to balance these areas, get tips on what to do to adjust to injuries (props, alternatives) in group classes, and learn about the subtle body relationships (mind/emotional/body connections) to these parts of the body. Mondays at 6pm in May at YoYo Yogi. Join me for an hour of yoga and meditation learning how to use your practice to connect and foster a deeper relationship with your intuition. Our practice is followed by a short talk. Celebrate the light with yoga, astrology, nature and community! Nurture yourself to keep that inner light radiant and bright! More details here. Fall into balance this Fall Equinox amidst the stillness and beauty of nature! Learn about the planet Mars, the archetype of Aries and the 1st house in community and by observing your own experiences. My latest astrological reflection can be found here. I posted these weekly and on facebook. Empowered: My Aries blend that helps give you courage and spark to be You! Unity: This blend supports balancing action and receptivity, yin/yang/masculine and feminine aspects. I sell my blends on my website or you can purchase them at Yoyo Yogi. f you prefer single oils, my favorites during this time are Lime and Grapefruit. I feel these can cool an overly fiery (TYPE A) disposition while stoking to the inner fire of intuition. he scents also invigorate and urge us towards joyful expression. Greetings to you all! Not long after Valentine's day we will find the Sun moving into Pisces. This archetype is about universal love, the unlimited potential, the mystery and the thinning of the veil between spirit and self, and others and self. I feel it is a potent time to deeply reflect on the heart and the matters of our times that are affecting our hearts. I don't know about you but I feel like my life, the world, is in chaos and mass disarray. There are moments in which I want to find the escape or fast forward button to the place where it will all make sense and feel right again. This has been the intense Aquarian energy mixed with the Aries energy that is swirling around. If we see it only from the symptoms it looks like someone or something screwed up and all this cannot possibly be "right" or "divine order". It doesn't make sense. No amount of logic soothes the shock and sting of it all. In a tornado within the eye of the storm there is calm, a completely counter reality to what is going on outside. I think the same force is working in our lives and in our world collectively. Truthfully it always has been, way before we were here. We are healing and often times with healing it bites, it hurts and it is not a pleasant experience and most of the time it takes a hell of a lot longer than we prefer. When we start a cleanse we often feel worse during the initial detox before we we feel better. When lifting weights, we get sore before we get stronger. And it all takes time. How much time? The time it calls for. That is where I struggle with the most personally. We can do and say all the "right" things and healing still goes at the pace best suited for our integration. At the end of the doing we meet fully what is underneath it all, the source, the wound, and our inability to change/fix/delete it. I am learning another aspect to healing. At some point we meet the edge of where our part in healing meets spirit's part and the processes merge. This for me in the place of unconditional love and acceptance. I am not all too familiar with this place. I now believe that "healing" is a human word for softening into our humanity and the acceptance of the perfection in the imperfection, simply put our growth. Easy to say and so hard is it to practice full and unconditional love of what is and trust in the process it takes to embody all of ourselves, messy, broken and often unexplainable. So much of the doing is aimed at fixing it and in doing so often we just place more distance between our hearts and this tender wound, the place where we reject ourselves and our reality. Acceptance and love seems like doing nothing, and perhaps that is just what it requires at times. It requires an openness that lets pure unabridged love pour through us in way we do not control. When we let go of the ideas we have around what is, we look intently into reality without an agenda or plan and we say with our beingness you must belong here because you are here. I think this can apply to our own physical and emotional wounds but also to our collective and global wounds. We all have our thoughts and opinions about what needs to happen to "fix the gaping wound" in our world. Many of us are called to act and support causes and that is beautiful and we should honor what our truth calls of us. But, underneath it all there is still a wound that on some level needs our acceptance and love to heal. What if none of our wounds really need fixing? What if they are purposely here to inspire greater embodiment of the mysteries of living in the now. Nature has always been flowing through her cycles of growth, maturation and at some point endings and rebirth. We may create our part in the "solution" and the "healing" but may we never forget that "to create is only to reveal what essentially is. It is the viid recognition of as -yet unknown in the known." Dane Rudhyar . In due time things find their place, just like in due time a heart break heals and opens again. While many events going on are heart breaking, meeting this heart brake with incessant fixing won't necessarily speed up the healing. Loving each other, holding one another in our pain just may. Unconditional love is so powerful way more powerful than any of our actions. May we creatively find our own way to being a vessel of this love to share with our own wounds and the wounds we are collectively sharing. This group are curious seekers willing to go dive into astrological topics that support working with the times. We meet monthly to discuss a topic and then have guided personal personal reflection time during the month to integrate the information that feels resonant in your own way. No astrology experience necessary. Where: If you are coming send me a message and I will send you the address. More information on my events page. Come join me for an afternoon of meditation, movement, breath, and aromatherapy as methods of connecting to your pelvic floor and creating a better balance of tone, strength, and mobility. Learn how these states affect the rest of the physical body and your relationship to self. The goal of the workshop is to come away with simple ways to support your pelvic floor health at home or on the mat. Register at YoYo Yogi. I am so thrilled to be able to retreat to this magical place for the Spring Equinox. This is a powerful time to ask the deeper questions of what are we ready create that speaks to our truth, our wholeness, and ability to be met. We will work with balancing our doing and being (yin/yang). More than ever we are being called to be able to "do" in new ways, ways that promote balance, partnership and the emergence of a new paradigm. Come join me for yoga, astrology, nature, and community and best of all deep personal inquiry. More details on my events page. This is a monthly community gathering where we talk about the astrology of the times and how to work with it and relate more openly to what is. No astrology experience needed. Just an open mind and heart! **I am offering my annual Cannon Beach Summer Solstice Retreat June 23-25, 2017. More information will be up soon on my website. Message me to be in the know! **This year I will also offer a Fall Equinox Retreat to a very special oasis of peace in southern Oregon, the Steamboat Inn along the Umpqua River. The dates for this trip are September 22-25, 2017. Again, details will be up soon but you can message me to be contacted directly with more information. As with all my retreats I combine yoga, astrology, aromatherapy and time for integration and reflection on how to be in your life more ease fully in relationship with the times we are in! I love how aromatherapy helps me adapt to the changing times and assist in my healing. I wanted to share some of blends that I recommend during these times. I can also make you a custom blend. If you work with aromatherapy yourself, then I highly recommend Peppermint oil and Cedar oil during these crazy times. Peppermint oil has been supporting me with opening to new ideas, new ways of relating and creating new neural pathways of thoughts, actions and being. Cedar oil is helping me listen to my deep inner wisdom and the quiet voice of my intuition. It calms me down and brings me back to my body. You can place a few drops of these oil directly on your body or for sensitivity in a carrier oil such as jojoba. You can also diffuse these oils or place a few drops on a washcloth in the shower. My blends can be purchased at YoYo Yogi or online. Yin your Yang: This blends calm down our overly "doing" and "type A nature" and balances it with peaceful being and allowing. Forest Walk: It is like taking a walk into a fresh perspective, drawing upon the ancient wisdom we carry within us to bring us back to center and calm. I post an astrological weekly reflection on my website and on Facebook. Check it out if you are curious what the heck is going on out there! Much love to all of you and our tender hearts, never underestimate the power you possess in opening to and allowing love to flow through you. Your greatest contribution rests in that quiet and meek presence. New Year's Greetings From Jill! Happy 2017 friends! Boy, what a year that was and goodness how this year has shown up already! In Portland, there has been record amounts of snow, which has resulted in lots of missed school days for the kiddos, lots of missed work days for the parents, as well as all the other driving and transportation baggage. While, I am enamored by the beauty of the snow and the winter wonderland it creates, I have to admit I have wrestled with the stress it has shaken up for me. Time off is welcomed when it is planned but what about when we are ready to work after the holidays and inspired to get moving ahead with new plans and ideas and then time off and slow downs are the guests we did not invite into our new year? How do I relate to this when my bank account is suggesting that more time off is not the remedy? I get to practice yoga I guess! I don't know about you but slowing down for me is a practice. My nature is to keep moving and to keep busy. Mercury has just come out of retrograde in the sign of Capricorn and we have been in a period of reflection on what goals and milestones are we feeding with our energy and are they in line with our heart and truth. Our recent full moon in Cancer has been inviting us back into our emotions. When I am busy, I can distract myself from feeling and relating intimately with my life. I can hit repeat and stay within my comfortable and familiar. When I keep moving I don't have time to reflect as deeply on the choices I am making and their affects. I perhaps don't allow the space to consider new choices that may be presenting themselves quietly. Like most people, I get in my routine and I like the illusion that I am in control. Then a snow storm comes to town and we are reminded that mother nature has her own plans and timing. Life has been a lot like that in 2016. I keep receiving the message to watch and be mindful of how I am relating to what is happening in my life. I can resist it and punch and kick my way through it and life will be as hard as I make it. I can give up and let life plow over me and feel trampled and helpless. Or, I can do my best to meet it with an open heart and mind and choose to perceive it as exactly what I need to continue to grow and learn how to ride the waves of life more skillfully. I am trying to relate more peacefully with what is by meeting it with like energy. So, when the snow storm comes instead of pushing against it and trying to make deadlines and work happen that is simply not reasonable, I allow for rest, I play with my kiddo, I connect to nature, and listen to the quieter voice inside. When the waves of inspiration come, I work with it in the ways that feel most natural and let my passions be my guide. When the lows and the drought come in then I can see this an opportunity to become more clear with my intentions and to feed my spirit. This is totally a life long practice for me and I get it "right" about 20% maybe. We learn in the Yoga Sutras that yoga (the practice of yoking all of ourselves) is to be practiced consistently, over a long period of time and with enthusiasm. So, I will most likely not get this "right" today but I attempt to face every day and the most challenging presentations of life with enthusiasm (a faith in myself and the process of growth) and faith that when I consistently show up for life with the intention to live in an embodied and truthful way that I will over time become more easeful with myself and with whatever arises. Step by step, day by day. I hope we all can take some time to recommit to our own practice of "yoga" and the tools that keep us able to relate to life in ways that say "yes" and "I believe in myself and all the possibilities" that I can't possibly know. I have not found any teachings that say that when you show up fully to even the hardest situations that eventually the hard stuff goes away and life becomes a sailboat into my dreams, but I do have faith that the more I practice being open to life that I am not as fearful about facing the unplanned and the challenge. I wish all of you a 2017 filled with inspiration to be you and to share your gifts with the world in the way only you know how! Thank you for being a part of my life and community! Please join me for 3 days of extended yoga focusing on the poses you see most often. Let's look at these foundational shapes with fresh eyes and with the intention to learn more about your own body through the postures. Take all three workshops or just one! Let's break through "right and wrong" and explore what it feels like to learn how the body teaches us to be aligned in our own unique ways. -Star Passengers Study Group: Take your time to learn how astrology can be a tool to navigate the twists and turns of life. We will meet monthly to explore an astrological topic and discuss how to work with the concepts to make them applicable. 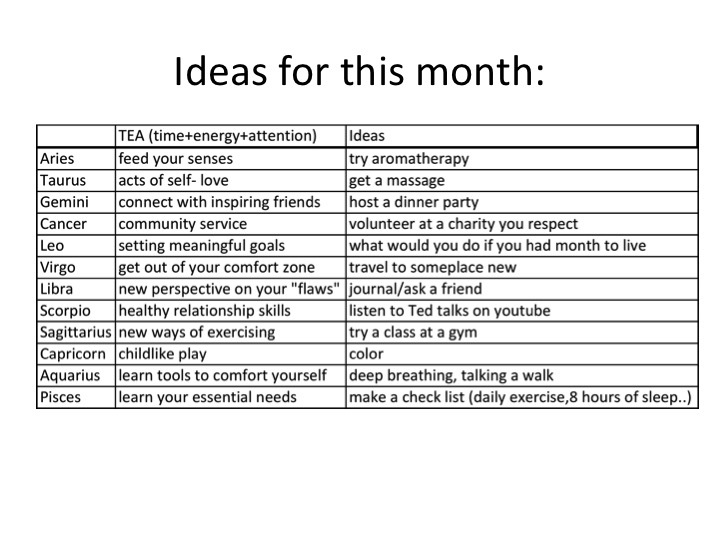 Throughout the month you will have material to work with for self-study. All classes will be recorded so you do not need to live in Portland to participate. Enjoy a community of fellow seekers as we learn more about ourselves and how to relate with life with more ease and grace. The group meetings will start in February. If you are interested please message me so I can find the best time for us to gather. -Monthly Mini Astrological Forecast Readings: I know many of your schedules prevent you from attending my monthly gatherings so here is a way to get a quick astrological outlook for the month and suggestions for how to work with the planetary transits that affect you. Try the first month free to get an idea if this is something that will support your day to day connection to what is through the lens of the stars! More information on my website for these events. Please message me to register or inquire further. Please check out my offerings on my website. Other than teaching yoga classes and offering private sessions, I offer intuitive and astrology readings. I also blend aromatherapy to support your intentions. Thank you all for your support in allowing me to offer my passions from my heart. Happy new year! Hope to see you soon! "Hatha yoga teaches us to breathe when things are intense, to soften where we are hard and to strengthen where we are weak. It shows us how to bend and how to be steady, how to aspire and how to accept." - Christina Sell, "Yoga for the Inside Out"
Hello friends! It has been a minute since I have sent a newsletter. This summer was a time of "undoing" for me and a chance to catch up with all the changes going on in my life. I am ready to begin planning some events to spend time with all of you. This Libra energy of air inviting us towards balance, harmony, beauty and partnership has been a nice change from the serious, busy and introspective Virgo energy. This last week I felt myself completely out of balance. I was tapped out and felt like I was standing at the bottom of a large mountain without any supplies to climb it. Everything felt urgent, difficult, heavy and I had a good story going on about how hard life was for me (wiping tears, add in small violin) I made a very atypical decision for me to take a week off from teaching to rebalance and recharge. I didn't plan to go anywhere. I knew I needed to be home and to unbusy-fy myself as hard as that would be and to allow time for the important but not demanding activities that I know feed and nourish me. Have you ever noticed that when you get busy and stressed..you speed up and usually drop off the very things that are essential for your wellbeing? Why when I am the most stressed do I feel that I don't have "time" to do the things I know I need to stay my best? It was quite an interesting week. I went to yoga daily in a studio which for me is an absolute treat. I made time to cook for myself and prep meals and to not allow myself to eat on the run or skip eating. I slept in. I took walks in nature. It was so wonderful and rejuvenating. So what happened after all of this? I wish I could say my problems went away and that I received divine messages directing my next moves to ease all my stresses. Well, not so much. I did realize that once I slowed my pace, the problems/projects that were causing me stress did not go away but the clarity and perspective that I could bring towards them helped me see that it was not as dim as I felt it all was. There was a way to move through them without causing myself to shut down and stress. I also noticed that I was so much more efficient and inspired to work on my projects feeling rested, well fed, and my body happy. My take away was that I must prioritize what creates balance and harmony for my spirit. Not because when I do life will be easy peesy, but because when I value what it takes to keep me balanced and harmonious, I have the best potential to allow me to tap into the wisdom within me and that is being presented to me from my environment. It was amazing the messages I could hear from the trees, from my friends, from my yoga and from my heart when I was at a pace and within the space to hear it all. I do believe life is partnering with us through hard times and also in blissful times. I know when I am all curled up in my ball of "poor me", I close down. I don't open and allow myself to receive what is available for me. 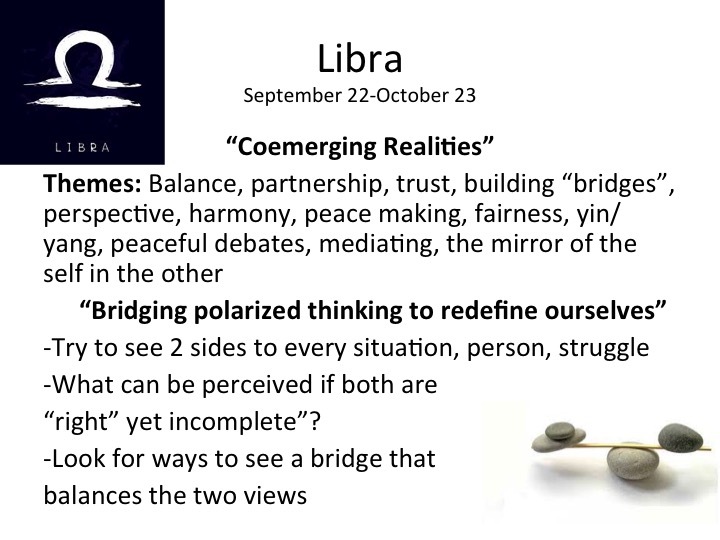 Libra calls us to these themes. We must have time for the beautiful things... whether those are for you a good music concert, a yoga class, an art show, or a walk in the park. The things that keep your balance. Balance for me is not equal part this and equal part that. Life does not always allow for that. We have to go to work and do this life thing. But, knowing what your balance quota feels like may be the elixir for keeping your stress level down and your joy level up. I would miss my classes if I never went back and I don't have the financial luxury of just taking yoga classes and cooking for a living so, I will go back to my life but what I know is that I need to make more room and time for what keeps my balance... I hope you can allow yourself this same invitation! Moonwatchers is a community of open minded friends learning how to use astrology as a lens to work with life skillfully and as easily as possible. We meet to talk about the astrological events of the times and how we can work with the current energies rather than fight against them. The moon travels through the zodiac in just shy of a calendar month. The moon sets our emotional tone and how we relate with daily life. Understanding the lunar cycle helps you understand what days are good for feeling inspired to check things off your lists and what days are good days to not push and rest. Lunar cycles also help us with seeding new intentions and following the fruition of our seedlings. Knowing your moon sign will help you understand what makes you feel at home and how you process emotions. Learn how to be in the flow and align with the energy of each day! Register and more information here. Feed your senses with aromatherapy, sound healing and yoga to catch up with yourself and find your flow again. Holiday season is around the corner and this is a wonderful time to go into this time full and recharged. Fill your tank in this afternoon of sweetness. A 90 minute yoga practice will be followed by a 45 minute sound healing svasana. Sign up atYoYo Yogi. Calling all teachers and yoga students that are interested in deepening your experience of yoga beyond the poses and physical practice. This workshop is part of the weekend workshop exploring the subtle body. In this workshop feel the energetic effects on your body through sound healing, chanting, aromatherapy and yoga nidra. No physical practice but feel the physical, emotional and energetic effects of this type of deeper body medicine. More information to come on my website and at YoYo Yogi! "Balance comes in the moments when you STAND UP for the life you TRULY WANT for yourself, by MAKING CHOICES that ALIGN with that." Is it really June? What? Wow! Yay! I hope this newsletter finds you all well. It is has been an intense time to say the least... more changes, endings, breakthroughs, transitions... we are all probably all very aware that we are alive and life is happening. We have been cycling though a very transformative retrograde cycle astrologically speaking. Without going into too much detail, this is a time of reflection, redoing, reviewing and basically realigning ourselves with what is true while detangling from habit or outdated ways of being. I don't know about you, but waiting, pausing, resting and being open to new directions is not the easiest for me to digest. I have seen many of the projects on my to do list come to a halt, some to be erased and some to be moved into the maybe later category and very few making their debut. This has made me feel emotions ranging from frustated to free to confused. After a very busy winter and spring, I decided to take a vacation to Sedona. I have been drawn to the desert for some time now and was eager to experience the medicine that only the desert can offer. I was hoping for some alone time, some quiet, some rest and some vision. Well, although my trip was quite amazing in many ways, I did not come home feeling like any of my intentions were satiated. At the top of the hikes there was noise..people talking, dogs barking, you name it..not meditative material. There was traffic. There were travel delays and unexpected events. I was so busy trying to see it all and take it all in that there was no time for rest. In fact I was up before 7am most days and out the door. Although this trip didn't offer me what I asked for, it offered me the wisdom that my peace and my vision is not at the top of a rock or in an energy vortex or beside a cactus. It is within me. I need to create more inner space and quiet to listen and hear it. The noise and busyness I was sensing in the desert was just a reflection of the busyness and noise within me. Fast forward a month later, I was unexpectedly gifted a weekend at the coast in the most magical and nurturing home. I went without any expectations, there was simply no time to prep. Just gratitude for time to get to the ocean. I didn't bring an agenda. I didn't bring my laptop, a book, or anything "to do". I napped. I watched the stars. I walked on the beach. I did simple, slow and healing yoga that my body craved. I had deep conversations with myself and I listened more than I spoke. I received.. so much that I did not ask for and more than I could have thought of requesting. My point in sharing this is that often times I think we have to "do" to receive. That we have to find the answer, the peace, the truth and we are looking for it everywhere but where it is..inside. It takes discipline and effort to create time and space for "nothing" time and for resting and listening. I am the first to admit I am not the best at scheduling and allowing it to happen. But, that weekend reinforced that I have to get past the feeling of boredom, past the guilt that I should be "doing something productive", that I "need" to do what I said I would or would I normally would do when space offers itself. I encourage you to create and accept some time to do nothing; take a nap, sit in the park, watch the ocean, listen to the birds, be open and without an agenda. Put your cell phone away. Don't even try to be meditative. Allow in the boredom, the judgements, the questions, the discomfort of just being. Allow the creative forces space to come in. Rest and receive your own inner stillness and harmony and tap into the deep well of your truth. It is bigger than an answer to a problem. It is bigger than your next project. Often I have found to go forward, you must first sit down and rest. You must allow the changing and the blossoming that is happening inside to catch up with the physical energy and momentum in which we assert ourselves into the world so that it can shift with us. Life will not stop when you rest but you will catch up with the part of you that is connected with the essence of what makes life possible. Many blessings and wishes of rest and rejuvenation to all of you! Enjoy being in nature as we celebrate the element of fire, the full moon and the longest day of the year! Meet at Gabriel park for a nature walk through this beautiful park then practice saluting the sun and moon with all levels yoga practice outdoors and end with a short talk about the astrology of the times and a meditation on what the full moon and solstice are lighting up within you! Cost: $20, Email me to register! Cost: $20 per class, Email me to register. Come join me on Tuesday nights for a series on discovering your truth through the lens of astrology. Learn how astrology can be used as a tool for your self-discovery and growth! No astrology experience necessary! Topics include: My Astrological/Elemental Make-up, My Soul Purpose, Weaving astrology into your daily life. Celebrate the full moon with a fun and beautiful hike up to our city's highest point, Council Crest! We will enjoy a nature inspired yoga practice at the top and before hiking back down! The hike is 1.7 miles each way. Bring your mat or practice in the grass! All levels welcome. If you don't want to hike you can drive to the top and practice yoga only. More details here. Email me to register. Come gather, enjoy community, learn, ask questions and listen to what the moon is illuminating for you! This group gathers monthly to explore how the moon cycles can help us navigate through the curves of life through the lens of astrology. No experience needed. Just an open mind and a curiosity! We will talk about the astrology of the times and the new moons and how to work with this in your own life! Experience the Aquarius Full Moon energy in the woods outside the city. We will take a short walk/hike around the magical land at Tryon Creek State Park and then enjoy an outdoor yoga class in their pavilion. Astrology + Nature + Yoga = medicine for the soul. All levels welcome. More details on my website! "Behind every problem, there's a question trying to ask itself. . . . Behind every question, there's an answer trying to reveal itself. Behind every answer, there's an action trying to take place. And behind every action, there's a way of life trying to be born. . ."